Summer Wheaton Restaurant Update: Aiiiiiii! Mrs. Me and I have not been eatin’ much in Wheaton this summer due to travel, family stuff, yada yada yada. Will try to rectify that come autumn. El Taco Loco has been open for a month or so, in the University Avenue strip mall next to El Pollo Rico. We should call it El Strip Mall? We ate there recently, review coming soon. We have still not been to El Catrachito, in the old Irene’s III microdiner space on University, despite its getting great reviews, but we hope to go soon. In the old Irene’s (no numerals attached) space on Georgia, a new Latino/”Tex-Mex” restaurant called El Fogon has been open for about two months now. I am skeptical about the Tex-Mex self-designation, since most places around here don’t really do it right, they just use it as a marketing ploy for people who don’t know better. But maybe the food is good anyway? Will check it out at some point. We used to like Irene’s back in the day, despite the constant too-loud music. Finally a little culinary variety: Tyler Cowen loves Thai Taste (11315 Fern, behind Hung Phat), his micro-review here (and my original review here). I love it when TC eats in Wheaton, because Wheaton, and also because it helps me calibrate my own restaurant-review palate. For example, he mentions the mussamun beef as a “very very good” dish, which it is — and yet it isn’t as good as the spectacular version Nava Thai too infrequently trots out as a special. He’s right about maximizing the condiments at Thai Taste, and I would add for all dishes, not just the soups. Overall I still think Ruan is at the top of the Wheaton Thai heap at the moment, but Thai Taste is certainly also recommended. Nava has been uneven lately, but if they have the mussamun available, it is a must-order. 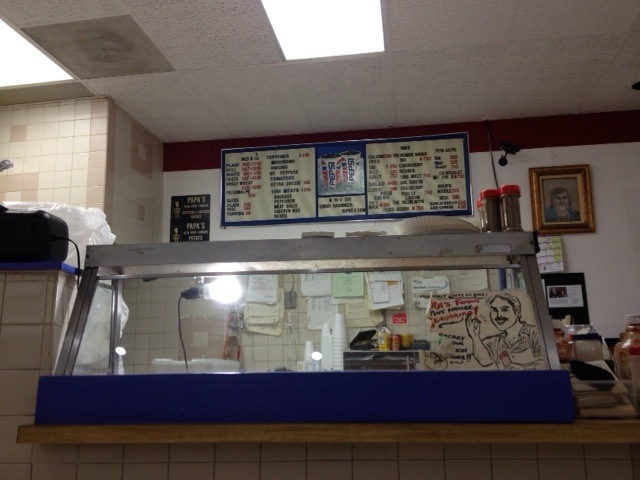 And lastly, a new cheesesteak chainy place (Mike’s?) is on the way to replace the Quizno’s in the Westfield Wheaton strip that also houses the Starbucks. I’ve been off Quizno’s ever since their Vegas airport location gave me the worst food poisoning ever, so this is a welcome change (since I also like cheesesteaks). I’d still rather give my sandwich business to Marchone’s, but it’s nice to have options. I had a distant cousin who used to say he was “nutsy” about things he liked. I would like to be nutsy about Wheaton’s Nut House Pizza (11419 Georgia), but I just can’t do it. Giving bad reviews to small locally owned restaurants kind of stinks, but I try to stay on top of all the eatin’ in Wheaton, and that means some occasional negativity. I’m generally positive about this neck of the woods, but I don’t want to turn into a mindless cheerleader. Most restaurants around here are, legitimately, at least adequate (especially now that Pashion has gone kaput). If you look on Yelp or the other internets you can find people who rave about NHP, saying it’s the best crust ever, people come from NYC to eat it, that kind of over-the-topness that would be hilarious if it weren’t kind of sad. * These are the kind of reviews that you wonder if they’re planted. Because NHP’s crust is not the best ever — if it isn’t the worst ever, it’s in the conversation. The truth is, I haven’t eaten their pizza since we first tried it about ten years ago, when it was inedibly bad. On a recent visit, I opted not to retry it, noting the single sad desiccated slice of cheese pizza sitting in the warming bin up front. It might be the same slice that was there ten years ago. It’s thin crust, New York style, but a far cry from typical New York quality. It is kosher — “under rabbinical supervision” says the sign — and maybe it is delicious relative to the average kosher pizza, I don’t know. I don’t need to try it again. 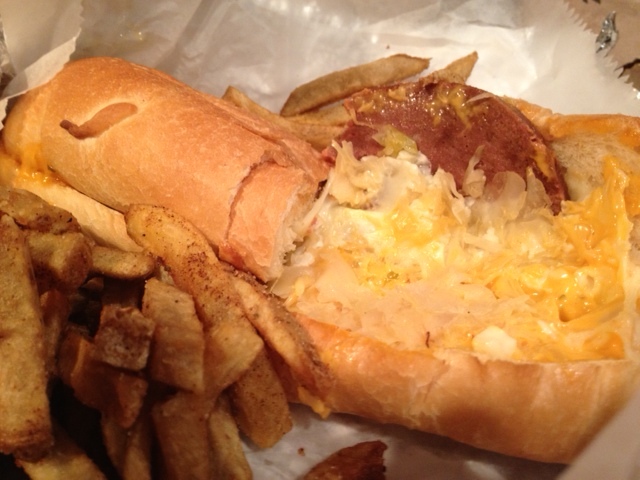 Instead, I tried the reuben sub and some fries, which weren’t inedible, but weren’t good either. The sub featured neon orange “Russian” dressing (which I admit I kind of like, a guilty pleasure), mediocre sauerkraut, quick-congealing white tasteless cheese that in retrospect I should have used to touch up the caulking in my shower instead of eating, and a thin slice of dry, pressed corned beef (presumably), although it was more like a weirdly spiced bologna. I assume it was somehow related to corned beef, otherwise it can’t be a reuben, right? Not good. The roll was actually a winner, crusty outside and soft inside, and could have been the framework for a delicious sandwich, but the other ingredients just didn’t measure up. 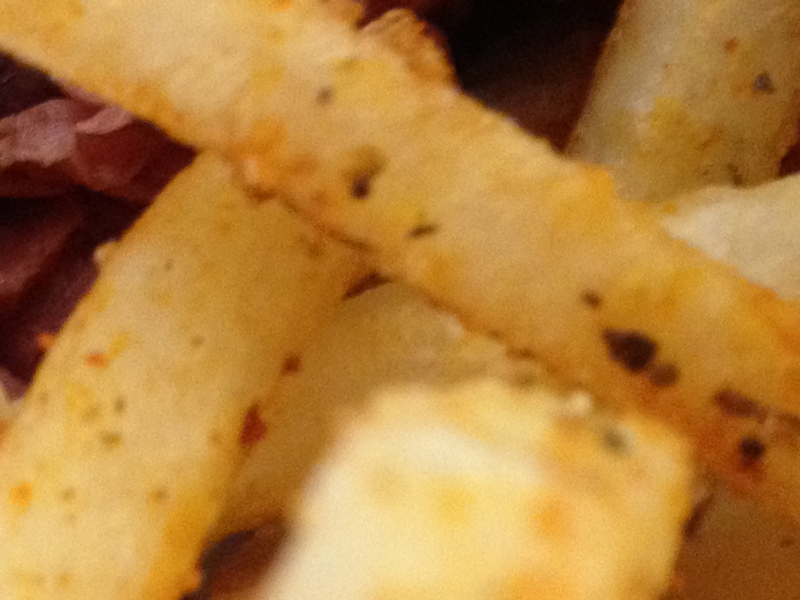 The fries smelled good, and looked fresh-cut and similar to Five Guys potatoes, but turned out to be wan and undersalted. Ira’s Famous Nut House Seasoning (according to the sign behind which the lonely pizza slice lies in its eternal gloom) doesn’t have much going on. Assuming that’s what was on the fries. There was discernible seasoning, it just wasn’t that tasty. Nut House is a total dive, all plastic and formica and tile and old-school signage, and that would be fine — even great! — if the food were awesome. The place is usually empty, and was on this mid-week visit except for one woman, who I suspect was the wife of the counterman. He was perfectly friendly and efficient, but that makes up for only so much. He was not Ira Feldman, the owner – or at least that was the owner when Patch did this writeup almost exactly two years ago. If he’s still in charge, he seems to have lost interest. If you compare the photos from Patch to my first photo here, in just two years, signage has noticeably physically deteriorated. Alas, the food was never good enough in the first place to noticeably deteriorate. Maybe I should consider it a blessing that they were out of knishes, which I had hoped to buy for next day’s breakfast. How can a kosher food purveyor ever be out of knishes? Shouldn’t they have a little cooler in the back with a few knishes at all times, in case of knish emergency? What happened to the rabbinical supervision? Surely any rabbi worth his pillars of salt would keep knishes on hand at all times. Sort of amazing they’re still operational, although I would guess they do a pretty good business with the thriving local Orthodox community — then again, wouldn’t you just go to the far superior Max’s instead? — and their rent is probably low. Revisiting after ten years seemed appropriate, but in retrospect Moses had a better idea with his forty years wandering the wilderness. He must have been filibustering, knowing Nut House Pizza awaited him back in the holy land. Wheaton may be feral, but there are better options than Nut House. Almost any option is better than Nut House. Which is a bummer, because we could really use a great pizzeria in this town. I admit, I couldn’t think of anything more creative for a headline. But “golly” is kind of a retro word and Ollie’s Trolley (425 12th Street, Metro Center) is a retro restaurant, classic old DC with its bright colors and kitschy gewgaws and all-original everything as far as I can tell. Like, at the counter, where you would normally put your tray — about the only place possible to put your tray — there is a sign warning not to put your tray down because the surface is uneven. The surface IS uneven, and neon orange, and should have been replaced years ago, but that ain’t Ollie’s way. And that’s okay. After a couple of recent visits, I have concluded that my previous visit 30 or so months ago was an anomaly, and the fries (which were mushy and blah then) are actually pretty good. Lately they have been crisp and spice-resplendent. The menu says the fries are “sprinkled with our blend of 26 herbs and spices” — they are certainly sprinkled with stuff, but 26 kinds? That’s more than double what Colonel Sanders came up with! I discerned salt, pepper, sugar, cayenne, paprika, sesame seeds, cumin seeds…maybe poppy seeds…are we at 26 yet? No idea what else is in there. MSG? Anyway, very different from Five Guys or KFC or most other places, but they’re above average if you like that style. Look closely, do you see 26 herbs and/or spices? Friends like Ollie’s burgers, which I think are only okay. Another friend loves the steak and cheese. I prefer the reuben, which is excellent in a greasy fast food way; the thousand island dressing might have been imported from Chernobyl, its light orange glow matching the counters that one’s tray dare not touch; the rye could be toasted a bit more; the sauerkraut and swiss are fine; the flavors and textures all blend into something much better than the parts might suggest. The bbq ribs — I think a limited time special, not on the regular menu — are also reportedly good, although the slab I saw looked more like an oversized gelatinous Swanson Hungry Man Salisbury steak. While I waited for my reuben, a dude was yelling loudly but (at first) unintelligably at Ollie’s staff. Turned out he was ecstatically happy about the bbq ribs. Someone pointed to the grill man, and Ribs Dude yelled at him: “you made these ribs? you my new best friend!” Must be some good ribs! That statement seems just so so wrong on multiple levels, and yet as a testament to the quality of the bbq ribs, it could hardly be stronger. Ribs Dude looked like a slightly younger, slightly heavier Cedric the Entertainer, and sounded kinda like Cedric too, or maybe more like Cookie Monster after a long weekend of chainsmoking and bourbon shots. In other words, someone whose opinion on bbq ribs should be taken seriously. I was tempted to say “I’ll have what he’s having” but decided against it. Maybe next time. Note: Ollie’s takes cash only. Not everything is great (e.g. dubious hamburger) at Max’s Kosher Cafe (2319 University), but the schawarma (their spelling) is among Wheaton’s finest sandwiches, up there with Marchone’s meatball sub and Saigonese’s bahn mi. At $8 for the big stuffed pita, it makes an excellent lunch. It is also participatory entertainment, as the guy behind the schawarma counter slices hot steaming lamb shards from the rotisserie right into the pita, and then negotiates with you on what else to stuff in there. These onions? Sure. Those onions? Why not. A third kind of onions? If you insist, my good man. Sauce, yes, but which one? Turns out the “very hot” sauce is not very hot, but that’s okay, it adds some juice to the package as does the hummus. Of course I want the hummus. Also tahini. 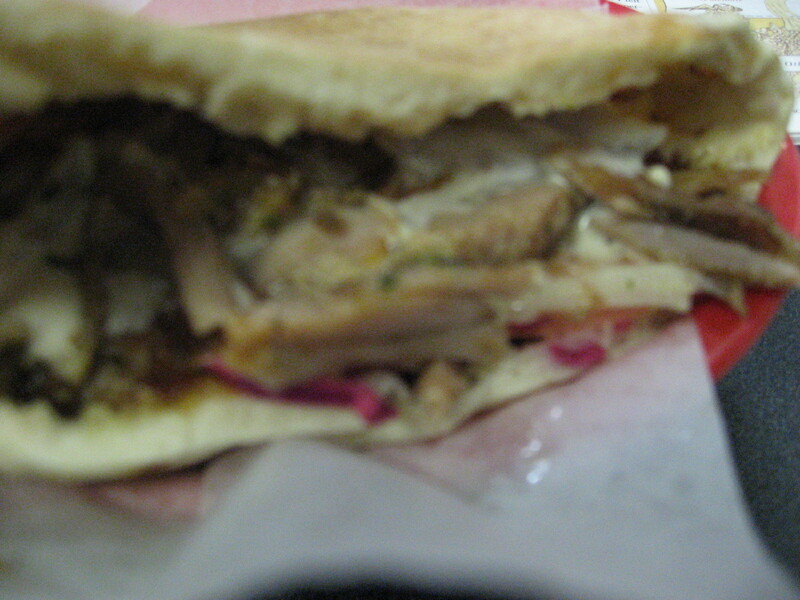 He eyed me warily when I hesitated about the tahini, and when I said sure, a little, I got about two ounces of tahini — approximately four times more than what I would call “a little.” Which was fine, since he knows better than I do what makes a great schawarma. Delicious. My friend JF and I used to get pepperoni subs from a place called Gilly’s in North Seattle on our way to Greenlake. The subs were great — does Thousand Island dressing make any sandwich great? — and though I think the actual name may have been Zilly’s, it looked like Gilly’s on the sign so that’s what we called it. That Gilly’s closed years ago, but I still have a positive association with the name in the context of lunch, and have been looking forward to trying Gilly’s Craft Beer & Wine in Rockville, which, despite its name, serves a variety of sandwiches too. No Thousand Island on the premises as far as I know, but some pretty good sandwiches nevertheless. Mrs. Me tried the grilled cheese on whole wheat bread, which was fine and a solid deal at $4.95. I was oddly in a bologna* mood and the “Joey H.” sandwich, with its pile of bologna, cheese, crunchy potato chips, and yellow mustard, made me happy. I don’t remember the last time I had a bologna sandwich so I can’t really compare it to anything, but it hit the spot. A couple other folks were eating what looked like decent Italian subs at one of the other tables — Gilly’s has a few tables in the front and a few in the middle of the store; the latter lack elbow room, as you would constantly have customers brushing past you as they peruse the wine selection, so we sat in front. * Contrary to what you may believe, I am not *always* full of bologna. Beyond the deli, which offers cheeses and dips in addition to sandwiches, Gilly’s is really about beer and wine. You can get a pint of draught beer (four or five to choose from) to enjoy as you wander the store, which of course we did: New Belgium Hoptober, very nice. Many more options than that in cans or bottles, a wide and high-quality selection, especially for a relatively small retail space. We thought the wine selection was less exciting and a tad overpriced — probably their beer prices can be beat elsewhere too, but not many places in MoCo match the selection. And the friendly staff and beers-on-tap make Gilly’s a primo shopping experience. Also the sandwiches. They’re next to Urban BBQ and around the corner from what used to be El Patio, the authentic Argentine cafe which (we discovered) moved to Loehmann’s Plaza (Randolph Road, still in Rockville) in August. Some kind of pizza joint is moving into their former space behind Gilly’s. Good little block for food, and parking is easy while El Patio is gone and pizza has not yet arrived. Is Avalon, NJ still standing? The ocean may be permanently closer to town after Irene, which was expected to erode some of the beach. Lucky for us, we were there the previous weekend. Didn’t eat out much (Mrs. Senior Me and I cooked up some delicious basil spaghetti, among other meals), but did get an Italian sandwich at Brady’s Hoagies (6740 Ocean, no website but here’s Yelp), and as one might expect of a hoagie from the Jersey/Philly nexus, it was fantastic. Roll: crusty outside but not too crusty, and soft inside but not too soft. Good ratio of meats to cheeses to onion/lettuce/tomato. No mayo, as it should be. Zesty dressing. I am confident Brady’s would have easily won last summer’s DC area Italian sub taste test, which was won somewhat improbably by Vace. 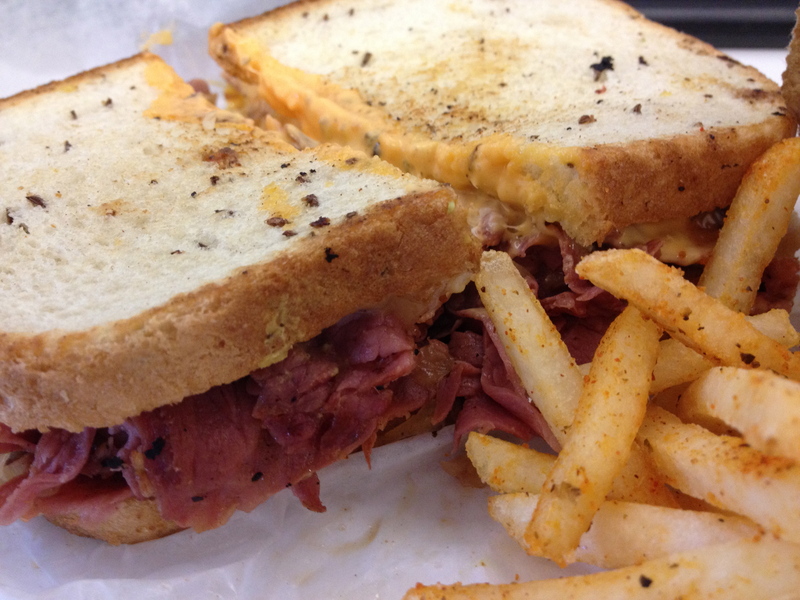 Brady’s is half convenience store, half deli. Kind of expensive, almost $10 for a footlong sandwich, and assembly took about three times as long as, say, Wheaton’s own Marchone’s. I figure the high price is a Jersey shore-in-summer thing, not specific to Brady’s — plus given the quality, it isn’t a totally unfair price. The sign outside says “Home of the Humongous Hoagie” but there’s no mention of that anywhere in any of the online reviews I found. They do make a “humongous” 24-inch sandwich, so it isn’t false advertising. But you don’t get any kind of bulk discount: the 24-incher costs twice as much as the footlong. Their potato salad is also pretty good, though could use more pickle or vinegar or something like that. I don’t have much to say about Amorini Panini (906 F Street NW), newish purveyors of panini sandwiches and a few other menu items. Locally owned, and I think they’re hoping to open more locations at some point. The F Street store has an awkward layout, though the clean industrial design works well enough. I’ve only been there at low-volume times; I suspect the place gets crowded and confusing during high volume. Despite being able to walk right up and order on each of my visits, it still has taken 7 to 10 minutes to get my sandwich — not objectionably bad for a panini, I suppose, but not exactly fast, and during the lunch rush it must take even longer. Beyond that, the food isn’t that great. The Buffalo Chicken sandwich was warm but the cheese was unmelted; the “artisinal” bread doesn’t seem special to me. The Italiano was better, but no better than the Potbelly Italian sub, which costs $1 less for a comparably-sized and similar-tasting sandwich. Most sandwiches are $6. They also have soup and salad. Amorini is also, alas, a Pepsi joint, though they do have plastic bottles of Coke. So, unexciting on the whole, and certainly not worth the longer walk from my office compared to Potbelly or Pret A Manger. I need to do a composite review of Metro Center sandwich options, if for no other reason than to get it all out of my brain so I can stop thinking about it. I would spend a certain number of minutes every day thinking about sandwiches anyway, because why not? But it has gotten to be too much.